With the increased functionality of the free SolidWorks Explorer download in SolidWorks 2007, it’s use is becoming much more prevalent. Even though it replaces the PDMWorks Workgroup stand alone client, not everyone will choose to use it for this purpose. The problem is that sometimes when SolidWorks Explorer is installed without the PDMWorks Workgroup add-in, it will show that the PDMWorks Workgroup add-in is active. The add-in check box will be checked, yet grayed out and unchangeable. Despite the fact the box is checked, none of the PDMWorks Workgroup functionality will be available within SolidWorks Explorer. This problem should only occur on machines that are currently or have in the past used a SolidWorks Network License or had SolidWorks License Manager software installed on them. For machines currently using a SolidWorks Network License, there is no current fix, however SolidWorks Explorer functionality should not be impacted. If a machine is not currently using a SolidWorks Network License, then a certain registry key will need to be deleted in order to remedy the issue. REMEMBER TO CREATE A BACK UP COPY OF ANY REGISTRY FILE BEFORE DELETING. By Browsing to the to the “My Computer\HKEY_LOCAL_MACHINE\SOFTWARE\FLEXlm License Manager” registry folder, the SW_D_LISCENSE_FILE can be found. Right click on the “FLEXlm License Manager” folder, and select export to save the registry at a secure location first. Then delete only SW_D_LICENSE_FILE from that registry folder. 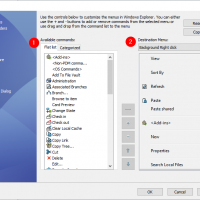 This will help ensure that your SolidWorks Explorer will not give you any errors by attempting to use nonexistent PDMWorks Workgroup functionality.